About this time I started watching Poldark. Isn't it funny that thing that happens when you buy a new car. Suddenly it seems like every second car on the street is the same a yours. You start noticing them at every set of traffic lights! This is what happened to me. 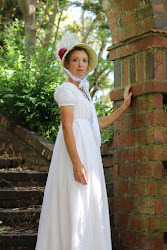 Once I started historical sewing for real, I started taking notice of it all around me. Poldark, for example. In the first season, I watched it for the story and the scenery. In the second season, I watched it for the costumes. Online again I went, this time to find a closed-front gown. These seem to be something that came more into fashion (at least amongst the gentry) later in the 18th century - more like 1780s. This time I found a really nice pattern company called Fig Leaf. I love the illustration first on the pattern, and then the fact that the pattern was taken from an extensive study of an extant gown for the use of a museum also gave me confidence. I try my best to do as much research as my limited resources allow prior to purchasing patterns, as it always costs so much to have them sent here. Its terribly disappointing to find out once it arrives that it's not authentic in its sewing techniques or pattern. As I had several other things going on in my life right at that moment, the pattern stayed unopened for quite some time. However, browsing through...a local but nationwide store that I shall not name...I saw the perfect fabric and had to purchase it. It was an upholstery-weight cotton, in a pale sky blue, with a cream and beige floral and bird pattern on it. I had heard that cotton wasn't used until after this time due to laws, but I'd also read that no-one actually obeyed these laws anyway, so cotton was my new best friend. I purchased 9.5 metres of it, and this sat in glorious righteousness in my sewing corner for a couple of months until I felt I could justify starting a new project. Isn't it always the way? I gleefully got out the pattern, cut it out, started working out my mock-up pieces to cut out on my calico...and found that I had 2 of one pattern sheet, and none of another. It happened to be the one with about 6 pieces on it! Grind to a halt. I frantically emailed the company, and they were very quick to reply and print off the correct page and send it to me. Phew! It had cost me $51 plus shipping to get it here so I was a bit concerned! Restart. I am disappointed to say, I didn't take any during photos. I don't know why, but I guess we all do it. I'm terrible and have to have the background uncluttered and neat, with no kids schoolbags and unwashed dishes to be seen, so photographing isn't always straightforward! I am pretty proud of my pattern matching. Pinked neck trim: used fray check. Lesson learned! Centre back pleats. Boned and stab stitched. Love that back. but I like the tidiness of how I whipped the lining down afterwards. Hook and eye closure. No, not brass, but nearly correct. Back neck. And sleeve seams are not finished, which is correct. There is a LOT of fabric in the petticoat: 4.5m from memory. I've reviewed the pattern, and for the most part it was excellent. I think the first pattern I used helped me understand the process, and next time I use the pattern, I will use some of the more accurate techniques that are described throughout the pattern as an option. The fabric was very heavy, though the pattern author assures me that it is more accurate to use this weight. Elsewhere I have read that the silks became more and more refined, so that by this stage (1780) they were the feather-weight silk that we see mostly today. I think a good compromise would be an upholstery-weight silk, and I have my eye on some for the next time I sew this particular gown. For this, the 'practice' round, I sewed the long, main seams with machine. This was the dress that wore my fingers completely out, and I finally had to learn to use the thimble. I read that thimbles are a main item in a seamstress's kit, and I now well-believe it. It's not fun when the thread end of the needle pierces your finger repeatedly!! Here is a very poor photo of the dress. I will take the next available opportunity to get all the sewing details pictured and uploaded, as it's such a special garment to me. 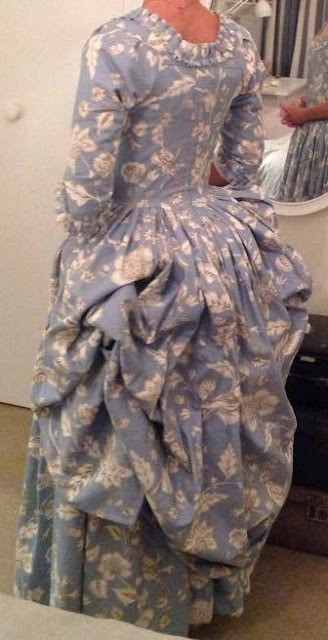 And I love the 'polonaise' style of skirt, though I believe it's not just the skirt-style that makes an authentic polonaise, but the sort of inverted centre front opening which is wider at the waist and meets at the chest. Pointless information, but I'm sure will be useful at some point! nb I now know this is an Italian gown, worn retroussee (puffed).